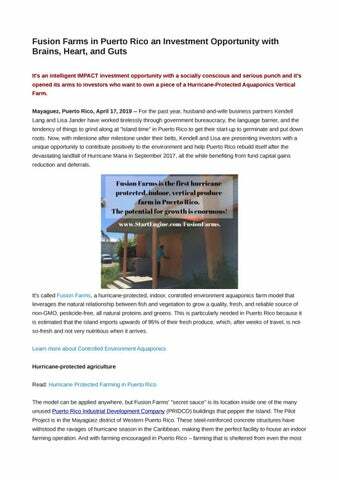 Fusion Farms in Puerto Rico an Investment Opportunity with Brains, Heart, and Guts It's an intelligent IMPACT investment opportunity with a socially conscious and serious punch and it's opened its arms to investors who want to own a piece of a Hurricane-Protected Aquaponics Vertical Farm. Mayaguez, Puerto Rico, April 17, 2019 -- For the past year, husband-and-wife business partners Kendell Lang and Lisa Jander have worked tirelessly through government bureaucracy, the language barrier, and the tendency of things to grind along at "island time" in Puerto Rico to get their start-up to germinate and put down roots. Now, with milestone after milestone under their belts, Kendell and Lisa are presenting investors with a unique opportunity to contribute positively to the environment and help Puerto Rico rebuild itself after the devastating landfall of Hurricane Maria in September 2017, all the while benefiting from fund capital gains reduction and deferrals. Fusion Farms' choice of agricultural products reflects the need for crops that are in high in local demand, grow easily and prolifically, and are considered valuable, such as basil, butter lettuce, microgreens, cilantro, mint, and whole Tilapia fish. Year two would provide the opportunity for Fusion Farms to reconfirm market demand for its existing agricultural products while exploring the feasibility of expanding this portfolio. This could happen initially with the planting of fruit trees. Year three could see the introduction of strawberries, green beans, Swiss chard, peppers, and tomatoes. "Our diversification is attractive to investors who might otherwise worry about their investment if anything were to go wrong with, for example, the lettuce crop," explains Kendell Lang. "Our plan offers diversity, stability and market flexibility." Tax-free exports A specific strategy and interesting twist to Fusion Farms' ultimate business plan is Kendell and Lisa's intention to apply for a Value Added Producer Grant for the purchase of equipment to extract essential oils from herbs such as basil and mint as an additional revenue stream. These oils are not only considered a highly valuable commodity but, more important to investors, they also qualify Fusion Farms as an Act 20 company under the Export Services Act. Act 20 provides tax incentives for companies that establish and expand their export services businesses in Puerto Rico. Under Act 20, income from eligible services rendered for the benefit of non-resident individuals or foreign entities (Export Services Income, or EIS) is taxed at a reduced tax rate of 4%. Moreover, dividends or benefits distributed out of EIS are 100% exempt from Puerto Rico taxation. This means that all of Fusion Farms' revenues derived from export sales would be tax-free. "If there's uncertainty or price fluctuation in the local markets for basil or mint, we have a multi-tiered alternate plan model," says Kendell. "We can sell fresh farm-to-table leafy green vegetables, turn excess basil into pesto, excess mint into mint jelly, and both into essential oils." The whole package With its keen environmental awareness, warm social conscious, sharp and comprehensive business plan, and numerous investment benefits, it's clear that Fusion Farms presents the investment community with an opportunity with brains and heart, while Kendell and Lisa's fierce determination and ambition prove they have guts! Learn more about this investment opportunity. About Fusion Farms: Fusion Farms PR is CEA farming which allows crops to grow faster, all year round in a hurricane-protected, climate-controlled indoor facility, using less water and minimal labor while eliminating crop failures. Fusion Farms, in the beautiful MayagĂźez district of Western Puerto Rico, is the ideal location to use an existing PRIDCO facility to grow mint, basil, cilantro, heirloom tomatoes, and leafy green vegetables, which are in high local and organic demand.